Not sure if the mask seems too big or if his chest doesn't seem big enough. Leaning toward the former, since he looks fine once the mask is off. I also assume it'll look better during movement, but it looks pretty good! I'm not trying to be nitpicky, just curious: Is there any kind of explanation of why he should wear that colorful clothes & mask? 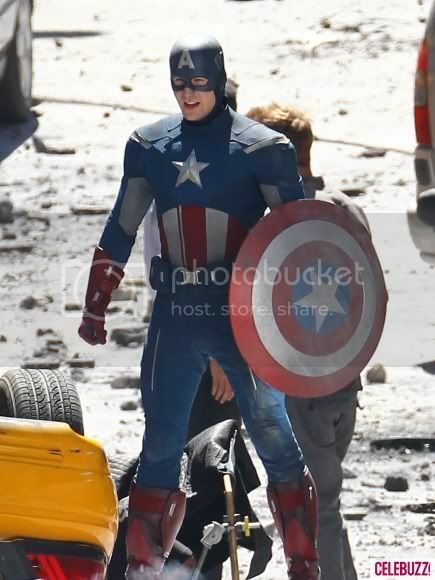 I mean, Tony Stark could just give him one of his suit and he'll be double-super-powered^^. 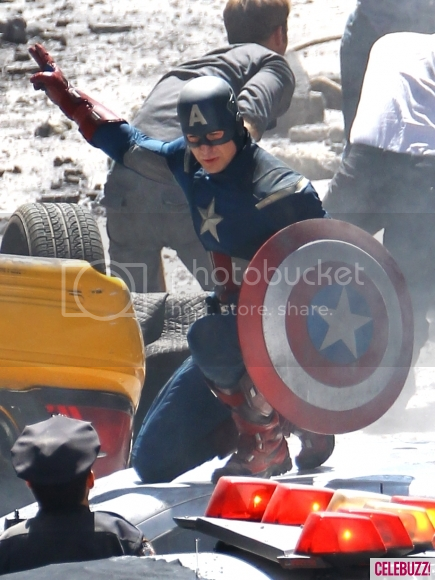 Granted, I haven't seen First Avenger and not well-versed in Cap's storyline. That's why I ask ^^. He's a symbol, first and foremost. He's meant to be seen and give inspiration, while leading his teammates and those under him. That being said, Stark has always kept his technology under lock and key (though it has often been stolen), so I doubt he would ever willingly build another suit, especially for someone who has already been so enhanced. 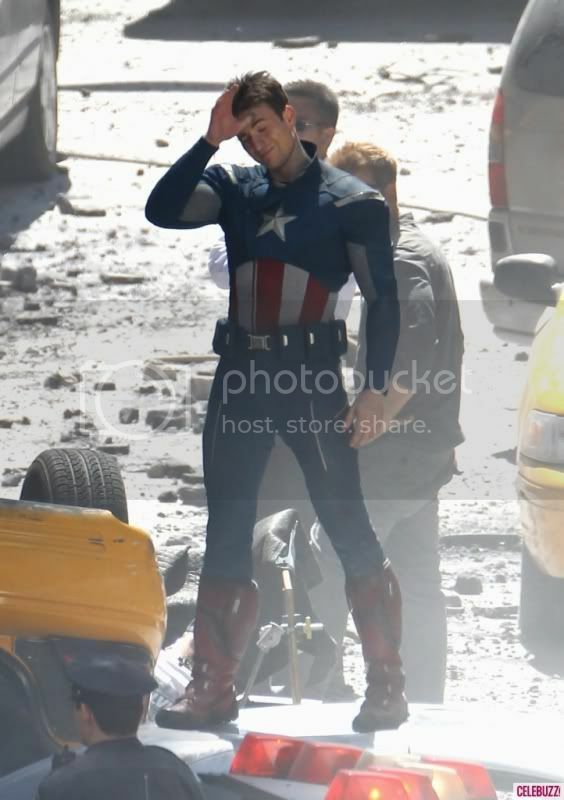 Yes, Chris Evans still looks good . And I agree that the helmet is a little to rounded. Is the new Bruce Banner here supposed to be a reboot of Hulk or just continuing where Louis Leterrier's movie left of? It's the same as the one Edward Norton played a couple of years ago. But he gave Colonel Rhodes the War Machine suit, which I'm assuming the military has a hold of now. Rhodes has always been with Stark/Iron Man. In the original comics, Rhodes saves Iron Man from the Viet Cong, and they started a long lasting friendship. Additionally, Stark has said on many occassions that Rhodes is one of the only people he trusts with the Iron Man tech. In the comics Peter Parker actually asked Tony to give everyone in the team a set of Ironman suit. Tony asked who is going to pay for it. Tony is rich, but he isn't swimming in money. He earned every cent he spent. And it is well established that Stark is paranoid about his technology being stolen. The US government can pay for it! LOL. That makes Tony sounds like a real cheapskate , though we all know the real reason behind it . And then they want their own suits in exchange, which is a big no no to Tony. Were they filming outside his apartment or something? Yes, they do filming outside his home. 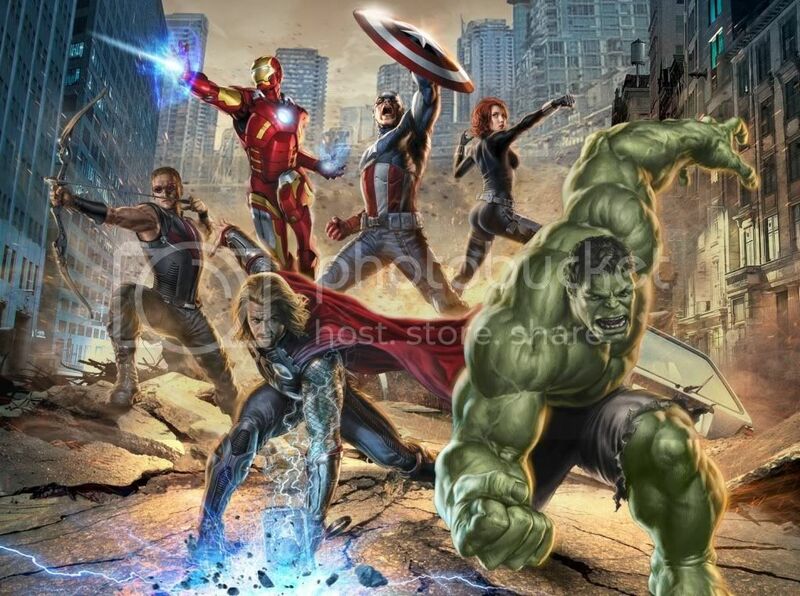 Detailed Description Of The Avengers D23 Footage; More Details Revealed! Thanks to io9, we have an even more detailed description of The Avengers footage shown at D23 earlier today. The footage began with Loki (Tom Hiddleston) in prison on board the S.H.I.E.L.D. helicarrier. Nick Fury (Samuel L. Jackson) addresses Loki through the clear panels of the cage: "In case it's unclear, if you try to escape, you so much as tap on the glass..." Fury then flicks a switch and the floor of the cage almost completely drops away, revealing a 30,000 foot drop to certain doom (or as certain as doom can be with someone like Loki). Loki simply observes, "It's an impressive cage", and he notes that it was clearly built for someone else. Fury says that it was - it was built for someone even stronger than him. Loki knows they're talking about the Hulk, calling him a mindless beast and wondering how desperate Fury must be to ally himself with the likes of such a creature. 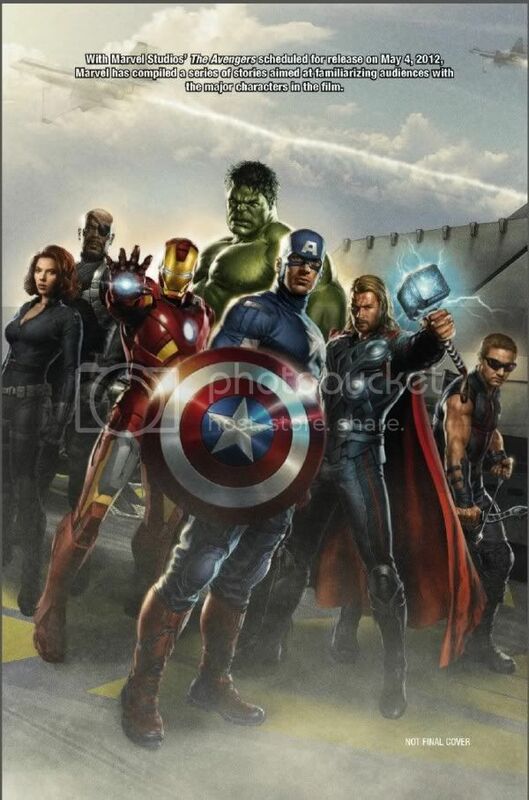 At this point we see all the various personnel who are listening into this conversation, including Hulk's human alter ego Bruce Banner (Mark Ruffalo), Black Widow (Scarlett Johansson), Thor (Chris Hemsworth), Captain America (Chris Evans), Hawkeye (Jeremy Renner), and S.H.I.E.L.D. agent Maria Hill (Cobie Smulders). Loki wonders what it must feel for Fury to have been so close to wielding the power of the Cosmic Cube, and how devastating it must be for all that to have slipped away. Fury accuses Loki of talking about peace and then killing for fun, and he tells Loki, "You have made me very desperate. You might not be glad that you did." Loki asks him what it must be like to be in the presence of real power - to which Fury simply replies, "Let me know if real power wants a magazine or something", and walks away from the cage. The Avengers look at the prisoner on the video monitors, as Bruce Banner caustically observes, "He really grows on you, doesn't he?" The footage then shows a bunch of action sequences, including a fighter jet flying over a city, an explosive truck chase, and - most intriguingly - a shot of Captain America and Thor apparently fighting each other, with Thor about to bring the hammer down on Cap's shield. All the while, we hear Nick Fury explain the mission statement of the Avengers: "There was an idea to bring together a group of remarkable, to see if they could become more. To fight the battles we never could." But the most epic exchange comes at the end, as Tony Stark (Robert Downey, Jr.) is behind a bar counter, mixing himself a drink. He describes his teammates: "Let's do a head count. We've got a couple master assassins, a demigod, and a living legend who kinda lives up to the legend" - that'd be Black Widow and Hawkeye, Thor, and Captain America. It's then that we learn Stark is talking to Loki: "And you, big fella, have managed to piss off every single one of them." To this, Loki responds, "I have an army." Stark's eminently quotable and awesome response? "We have a Hulk." We then see the Hulk roar, and the footage ends. While it's still early days - indeed, filming is still two weeks from completion - this is looking very, very good so far. And we have yet another revealing description of the footage from Entertainment Weekly. While much of the plot remains under wraps (look for an EW cover story next month to reveal First Look photos and exclusive details of the story), D23 attendees got to see snippets of two tense scenes between Nick Fury and Loki, and Iron Man alter-ego Tony Stark and the god-gone-wild. The first sequence featured an imprisoned (or is he still somehow in control?) Loki, locked in a cylindrical glass and steel cell on board the S.H.I.E.L.D. hellicarrier. “Built for something a lot stronger than you,” Fury snaps back. The second scene is a conversation between Tony Stark and Loki, apparently… in Stark’s private bar? In any case, Tony’s having a drink. “I have an army,” Loki snarls. Last edited by LoweGear; 2011-09-02 at 05:45. My Twitter account! Thanks to Godlike1889 for the sig! Huh. I should probably watch Iron Man 2 and Thor first if I plan to see this.